Well, we knew it was coming, we just didn’t know when it would arrive. It is crazy and it is bizarre and now Goat Simulator is finally available for Android and iOS devices. This is the official game directly from developer Coffee Stain Studios, not one of the many clones that are everywhere. Since this game was never about good controls and gameplay it translates well to mobile. You don’t hear that about most mobile games. Most games try to have good controls. 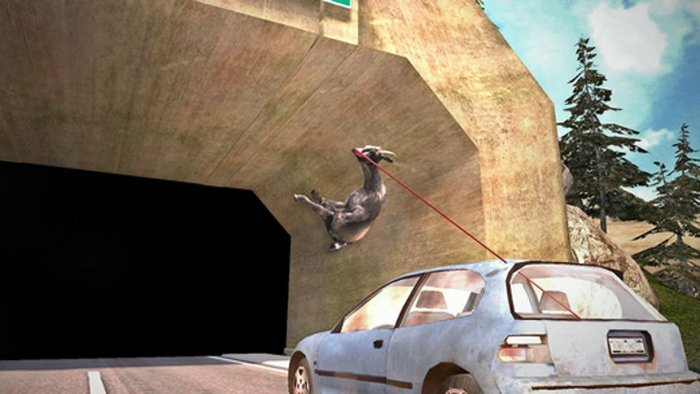 The point of Goat Simulator is different from most games. The game is overflowing with bugs, bad physics, and general mayhem, but that all makes for a fun and ridiculous funny game. On the mobile version, you get a virtual joystick for movement and buttons for jump, headbutt, and grab. It has objectives and achievements, but honestly just go with the chaos and embrace the mayhem. There are options for costume changes and even a jetpack. Goat Simulator will cost you $4.99 on either platform, and that will get you versions for phones or tablets. For Android, you’ll have to have version 4.0.3 or higher, and you’ll need iOS 6 or higher on an Apple device. Let the weird destruction begin.